Finding the perfect foundation that matches your skin is probably the hardest and most overwhelming part when it comes to buying makeup. Before you pick your foundation there are a few things to take into consideration before buying the foundation. 1. What skintype do I have? In order to pick the best formula that works best with your skin, you need to know what skintype you have. Dry skin: Choose a moisturising liquid foundation that contains oils to help hydrate the skin. Look for words like “hydrating” or “moisture rich” on the bottle. Oily skin: Choose a oil-free liquid or a powder foundation and look for “oil control” or “mattifying” wording on the bottle. Combination skin: Determine if your skin is more oily or dry and go from there. Cream-to-powder foundations usually works great on combination skin. 2. What coverage/finish am I looking for? Light, medium or full coverage? Depending on how “good” your skin is, choose a coverage that suits your needs. Remember: The more coverage the more unnatural your skin will look. 3. What are my undertones? 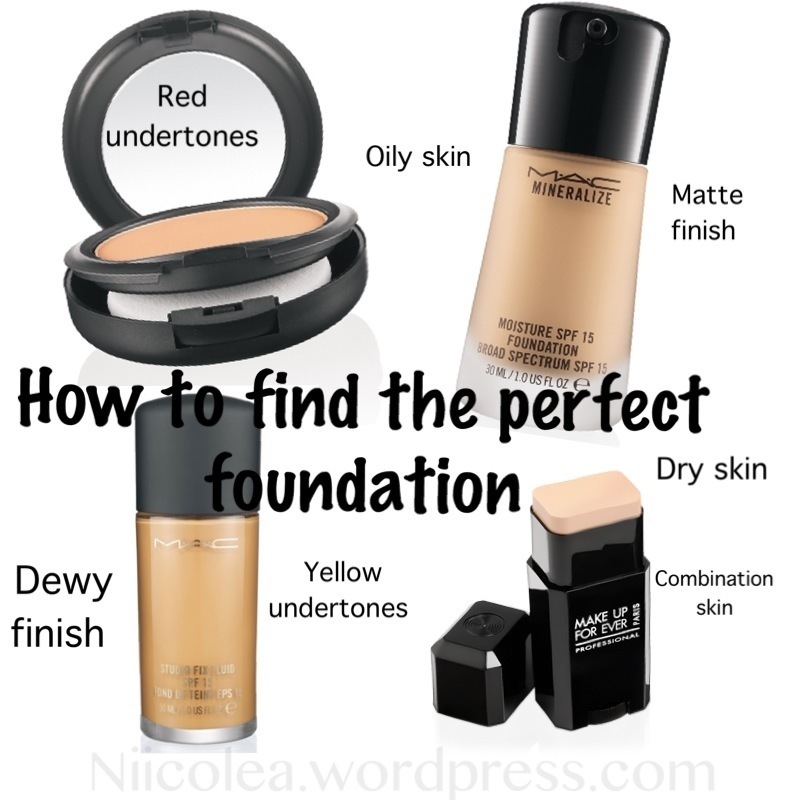 Knowing your undertones is very important when it comes to finding the perfect foundation for you skin. If you have yellow undertones go for a foundation with a cool tone, for MAC foundation you would match with NC shades ( NC standing for neutral cool). If you have pink/red undertones find a foundation with warm undertones with NW shades (NW standing for neutral warm) for MAC foundations. How to determine your undertone: If your veins look more blue you are most likely to have pink undertones. If your veins look more green, then you have yellow undertones. 1. If you are in-between two shades choose the color that is lighter. It’s easier to darken the skin by using Bronzer and contouring. 2. Try the foundation on your face (e.g jawline) not on your wrist. 3. If you have really oily skin, try to use a good face primer before applying your foundation. I don’t use foundation, but I really like this post! Good tips! I use only a colored cream, like Essence My Skin or similar, to put a bit more color on my face because I’m pale, expecially in winter! Great tips, Nicole. Going to share this article on Twitter. I have a combination skin with the tendency of being sensitive, so i try to stick with Oil-free, dermatologically tested and suitable for sensitive skin type of foundations. For now my very favorite one is the Max Factor Facefinity All Day Flawless 3-In-1 – which combines the lasting power of a primer, the blendability of a liquid SPF foundation and the targeted coverage of a concealer. What more can you ask, right?! Actually i accidentally found this foundation, had a mini sample in one of those magazins and without even holing to find the right shade & texture i got the winner right there. Have a look on that one, you might like it. It’s so hard to find good foundation! Yes it sure is! Hope this post helps to make it a bit easier! Yes it does, thank you!